LORETTO, Pa. -- Nadege Pluviose looks for an outlet pass against Saint Francis on February 28, 2019 (Samuel Anthony/RMU Sentry Media). MOON TOWNSHIP — The Robert Morris University women’s basketball team (14-9, 11-1 NEC) play on their home court this weekend as they celebrate Senior Day against the Saint Francis Brooklyn Terriers (14-10, 8-4 NEC) on Saturday. The Colonials only have two seniors completing their last season as a Colonial: guards Nia Adams and Shakema Dashiell. The Colonials last game was against the Saint Francis Red Flash (12-13, 9-4 NEC) and the Colonials were able to get the victory in the end. The Terriers last played the Central Connecticut State Blue Devils (6-17, 3-10 NEC), and the Terriers ended the game with a win. The Colonials will also take on LIU Brooklyn Blackbirds (2-21, 1-11 NEC) on Monday, February 25 at 7 p.m. The last game for the Blackbirds was against Sacred Heart Pioneers (12-13, 9-4 NEC) in which the Blackbirds took home the win. After losing their undefeated record in conference play to Mount Saint Mary’s, the Colonials got back on their feet as they defeated the Red Flash 66-60. In the first quarter the Colonials had the lead as the score was 19-18, but in the second quarter, the Red Flash took the lead as they added 15 points to their score while the Colonials scored just 13 points. In the third quarter both teams scored 12 points, but in the final quarter of the game, the Colonials ended the Red Flash as they scored 22 points while the Red Flash only put up 15 points. The star players for the Colonials were Nina Augustin who had a career-high 18 points and four rebounds along with Nneka Ezeigbo who had 16 points with nine rebounds. 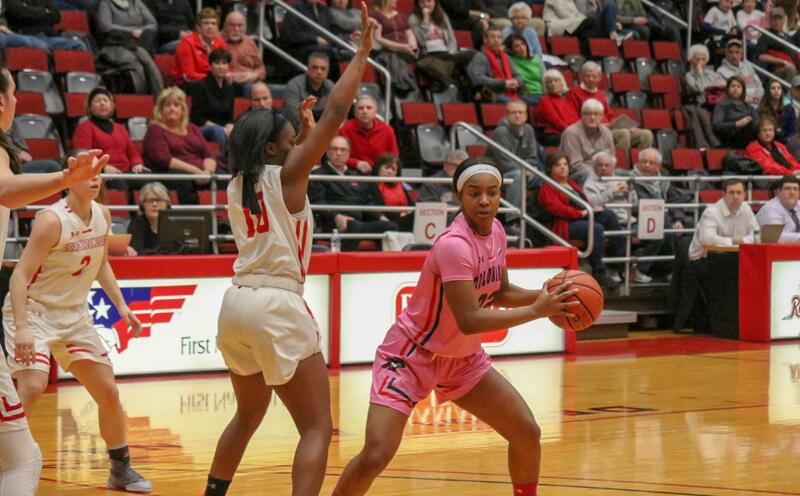 The star player for the Red Flash was Haley Thomas who scored 17 points and recovered eight rebounds. The last game for the Terriers was a win against the Blue Devils as the final score was 70-58. The Terriers never gave up the lead in the game as they scored 18 points in the second and third quarters. In the first and fourth quarters, the Terriers scored 17 points. The Blue Devils scored less than 15 points in the first three-quarters of the game. In the last quarter, the Blue Devils scored more than the Terriers as the Blue Devils scored 20 points while the Terriers scored 17 points. In the Blackbirds’ last game, they took the game away from the Pioneers with a final score of 69-64. The Pioneers had the lead in the first quarter with 17 points while the Blackbirds scored 13 points. The Blackbirds kicked the scoring into gear in the second quarter as they scored 23 points while they held the Pioneers to 11 points. The Pioneers took the lead back in the third quarter as they scored 16 points while the Blackbirds scored 12 points. In the final quarter of the game, the Blackbirds edged out the Pioneers as they scored 21 points while the Pioneers scored one point less than the Blackbirds. Nneka Ezeigbo (RMU): Ezeigbo leads almost every offensive and defensive category for the Colonials’ squad. On the offensive side of her game, she has a total of 266 points with 108 field goals. On the defensive side of the court, she has a total of 179 rebounds and has 43 steals with 23 blocked shots. Amy O’Neill (SFB): O’Neill has a total of 172 rebounds recovered with 55 steals. She led the team in assists with 207 and has started and played every game for the Terriers this season. She also has a total of 247 points this season. Jeydah Johnson (LIU): Johnson has the most time on the court and has scored a total of 326 points this season. She leads the team in three-point shots with 41 and has a total of 103 rebounds recovered. I think the Colonials will win both games, but the scores will be very close. The Colonials will use the momentum of their last win and the excitement of Senior Day to come out with two victories. Also, the team is well rounded with their offense and defense. I think the score of the game against the Terriers will end with a final score of 70-65. Also, I think the game against the Blackbirds will end in a final score of 74-70. The Colonials go on the road as they take on the Wagner Seahawk on March 2 at 1 p.m.
My name is Delenn Poe. 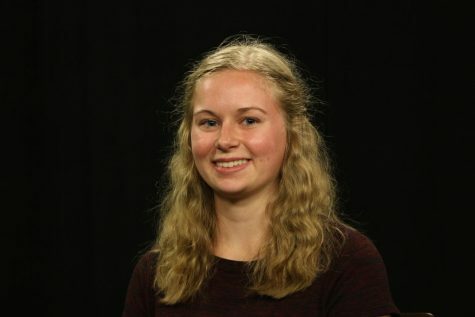 I am from Plum, PA. My major is Digital Cinema. I am a videographer and a package reporter for sentry.